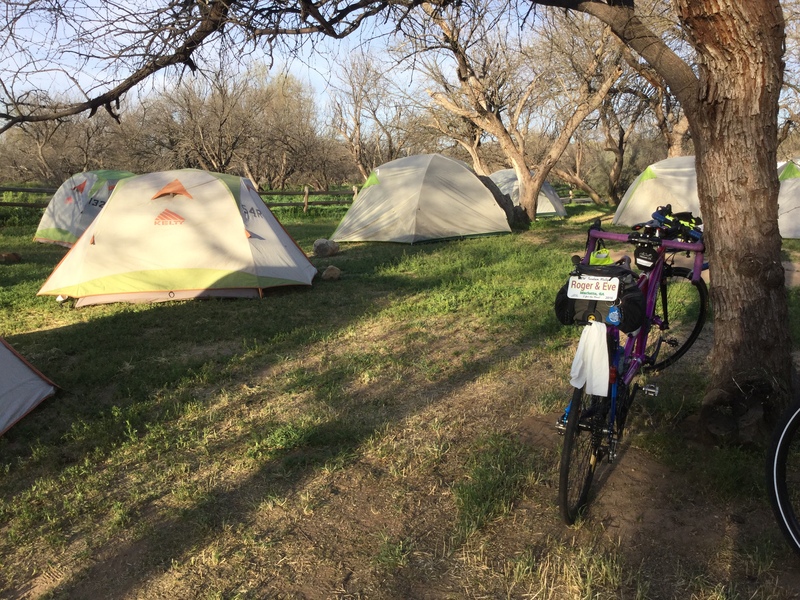 When Roger and I started toying with the idea of riding our tandem cross country to celebrate our 60th years, in addition to complicated logistics there was the issue of camping. As many of you know we are die-hard hotel people. 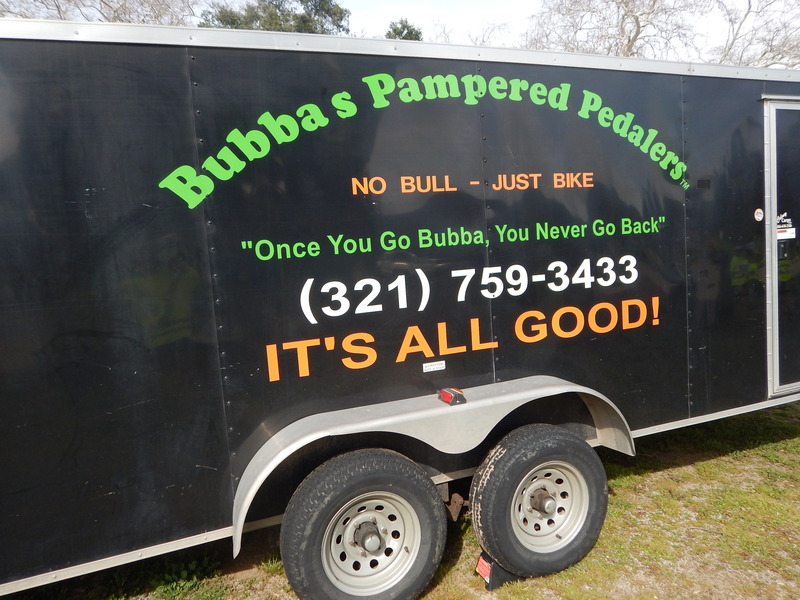 So this trip we are on with Bubba’s Pampered Pedalers is WAY out of our travel comfort zone! 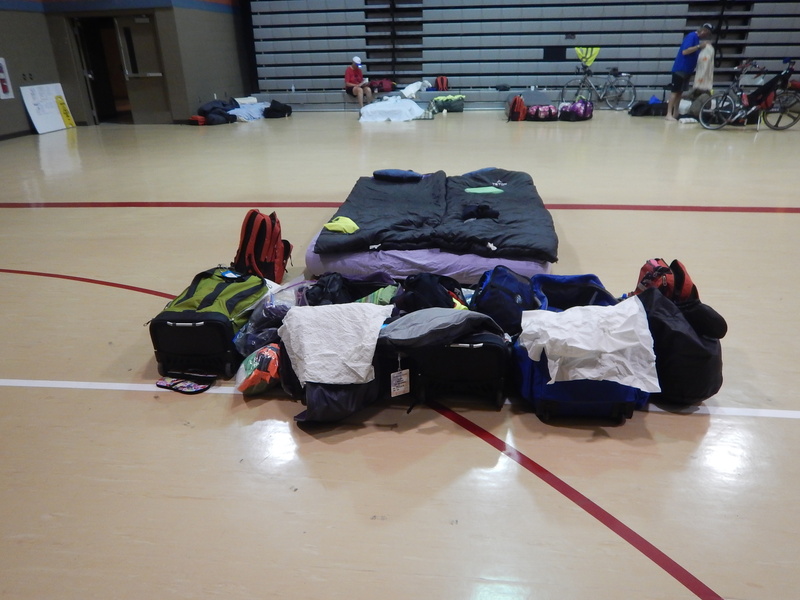 We are now two weeks into our trip and experienced campers! At this point, I’m not sure whether I prefer indoor camping or tenting. Each has it’s advantages and disadvantages. The tent provides a certain amount of privacy. It’s just the two us in our own little world and even though you may hear someone sneezing or snoring in the next tent, you still have your own space. 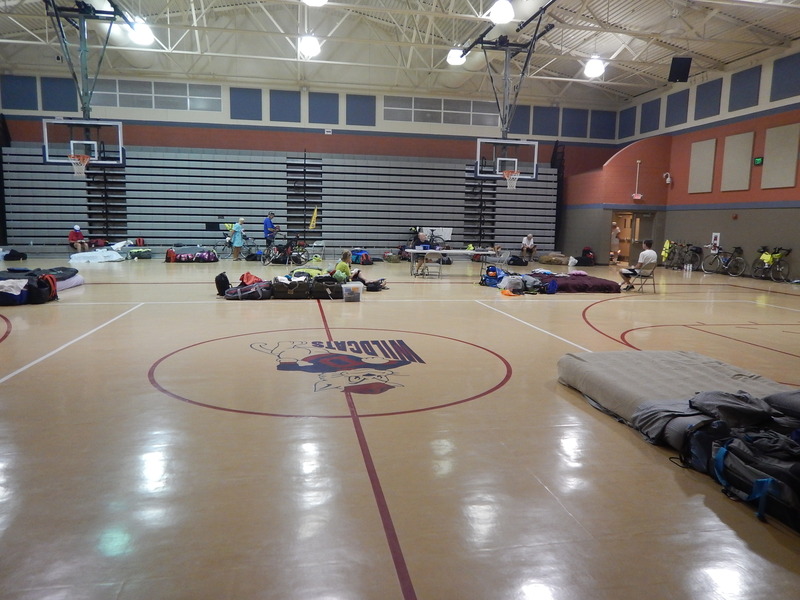 Indoor camping reminds us of the BRAG (Bicycle Ride Across Georgia) refugee city in the school gyms. But in this situation you are sharing one large room with between 24 and 40 people. Sometimes the staff is set up in a different room than us if we are in an armory. We are spaced out a good bit. We are toasty warm through night, we have bathrooms available all night and we have light until 9pm so you can sit up and read someplace other than the warmth of your sleeping bag. 1. 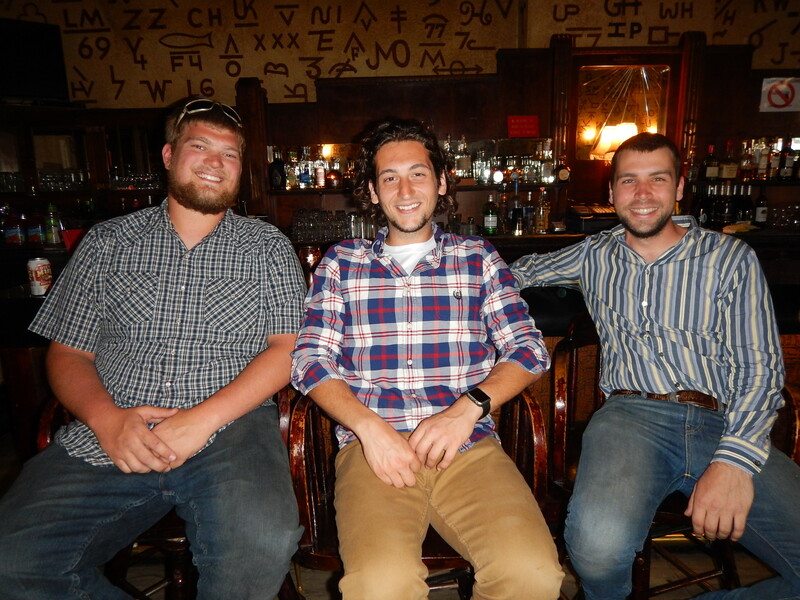 Tyler, Drew, and Alex are “The Wolfpack”, the guys who have to set up our tents, blow up our air mattresses, and haul our luggage to the tents. Plus, they set up the chairs and tables in our “Pampered Zone”, where we congregate after the rides. They do this every time we change cities, which will happen about 45 times on this trip. My GoGirl (google it, no photo provided). 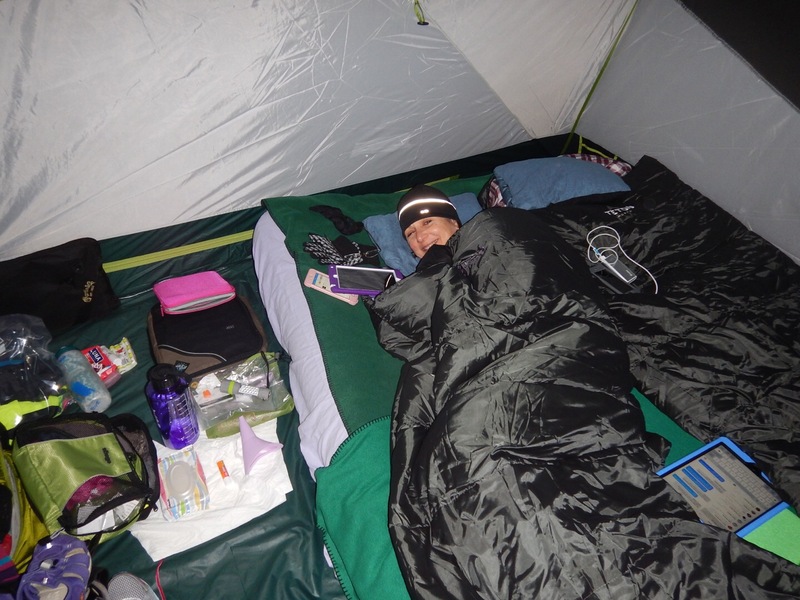 It’s what made this trip possible for me and it’s what gets me through the night in my tent! A final thought, camping and cycling every day requires serious organization and I am really good at that so I pretty much have this under control. You guys are awesome! We love reading your recaps. Keep smiling!! Since you weren’t riding today, I didn’t follow your “dot”. Now I realize it would have been fun to watch you in Mexico. Ahhhh… But there IS a picture! Good eye, Laura! I had to go to Google first! Indeed. Watch out for the purple water bottle! 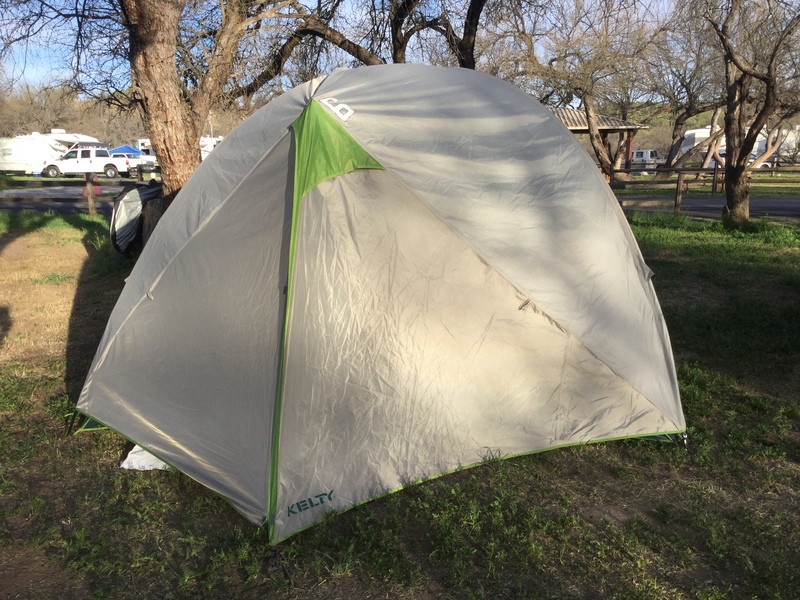 So, maybe you will want a tent for your Birthday? in New Mexico. Will watch for your photos and blog later today.